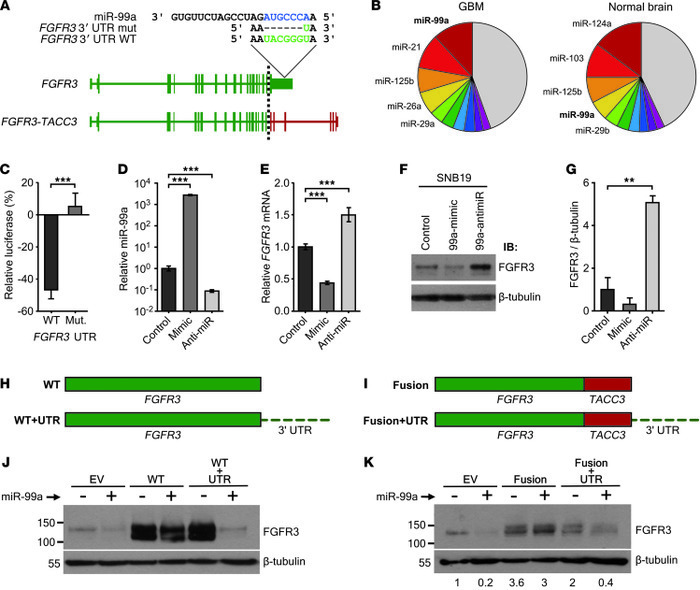 Loss of miR-99a binding site in the FGFR3-TACC3 fusion transcript leads to increased levels of FGFR3 protein. (A) Schematic showing the location of the miR-99a binding site in the 3′-UTR of WT FGFR3 and its loss in the FGFR3-TACC3 fusion transcript and construct with the binding site deleted (mutant). (B) Pie chart illustrating high miR-99a expression in both GBM and normal brain. Expression values were calculated based on pooled small RNA sequencing. (C) Luciferase assay of WT FGFR3 3′-UTR versus mutant after miR-99a overexpression. (D) qRT-PCR of miR-99a in parental SNB19 cells after transfection of control, miR-99a mimic, or anti–miR-99a. (E–G) qRT-PCR (E), immunoblotting (F), and densitometry (G) of FGFR3 in parental SNB19 cells after transfection of control, miR-99a mimic, or anti-miR. (H and I) Schematic of WT FGFR3 (H) and FGFR3-TACC3 fusion (I) cDNA, with or without FGFR3 3′-UTR attached. (J) Immunoblot of EV, WT FGFR3, and WT FGFR3 plus FGFR3 3′-UTR after transfection with miR-99a. (K) Immunoblot of EV, FGFR3-TACC3 fusion, or FGFR3-TACC3 fusion plus FGFR3 3′-UTR after miR-99a transfection. Relative densitometry (below) was normalized to β-tubulin. Error bars denote SEM. **P < 0.01, ***P < 0.001, Mann-Whitney U test.